Distribution area: The snake can be found throughout Thailand up to a height of around 1000 meters. 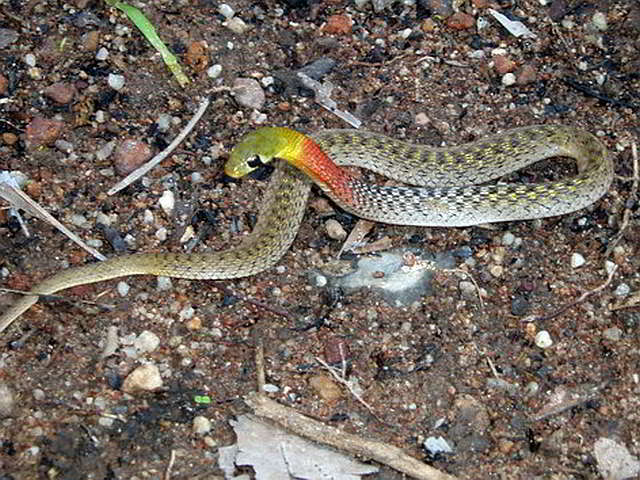 Altogether the snake is present in many areas which start in Thailand through to Myamar, Laos, Vietnam, Cambodia and China. Habitat/behaviour: The Green Keelback is a snake which lives on the ground and is active in the morning and at twilight. It is generally found near water and near damp areas. They mainly feed on frogs and fish. The colour of the animal can vary from specimen to specimen. Danger level: Nothing is known about invenomation of humans. However the Rhabdophis species should generally threat with care, because it is a rearfanged snake. Therefore please refer to the recommendations on Rhabdophis subminiatus. These snakes are usually a lot smaller. The average length is approx. 70 cm. 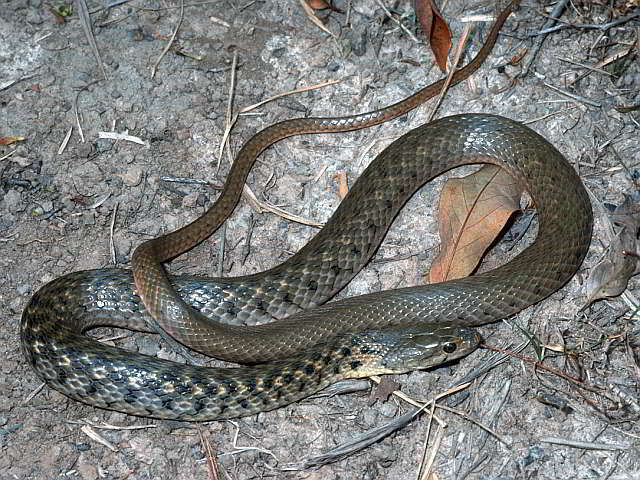 Behaviour/habitat: Rhabdophis subminiatus is an adaptable snake which is at home in the woods as well as in residential areas and gardens. It prefers life near to water. The snake is active during the day. Their food is made up of frogs and fish. If threatened, they spread out their red neck area and erect themselves. Danger level: Bites can lead to severe invenomation in humans. Distribution area: In the whole of Thailand. 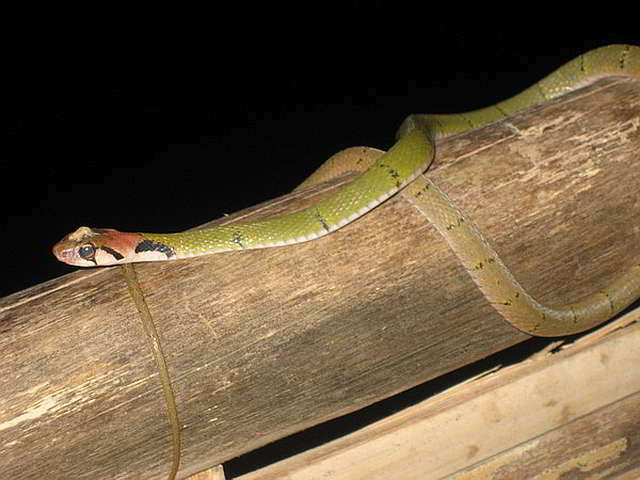 A very common snake found in rice fields, canals and garden ponds and thus also in direct residential surroundings. Behaviour: Active during the day, bites very quickly and copies the behaviour of a Cobra. Danger level: Non-venomous but biting. Distribution area: Throughout Thailand in heights up to 1600 meters; more commonly found in flat land up to a height of 300 meters. Habitat and behaviour: Xenochrophis piscator can mainly be found near waters. 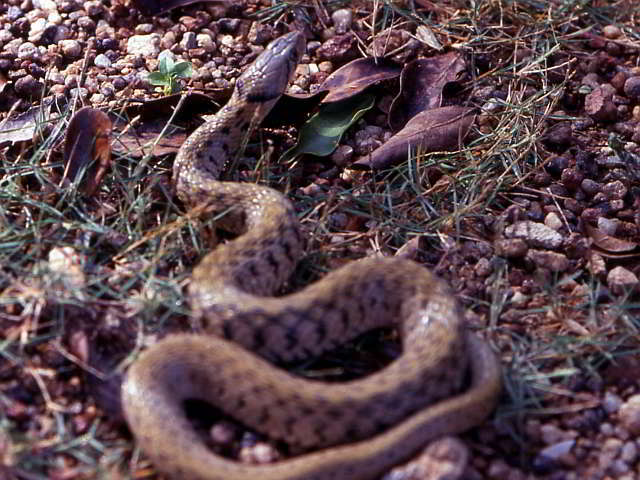 The snake is usually active during the day and often covers large distances on the hunt for food. Many can be found on the streets after a heavy rainfall. If agitated the snakes flatten out their neck region and erect their upper bodies. Due to this defensive reaction they are often mistaken for a cobra. When fleeing the snake moves along smooth surfaces (e.g. streets) in sideways movements and jumps forwards.